Local protestors gathered at the intersection of Routes 82 and 926 in Willowdale to protest the expected confirmation of Judge Brett Kavanaugh to the U.S. Supreme Court, after allegations were made against him involving sexual misconduct and/or assault. The number of protestors nearly doubled from the time this image was shot within less than an hour. 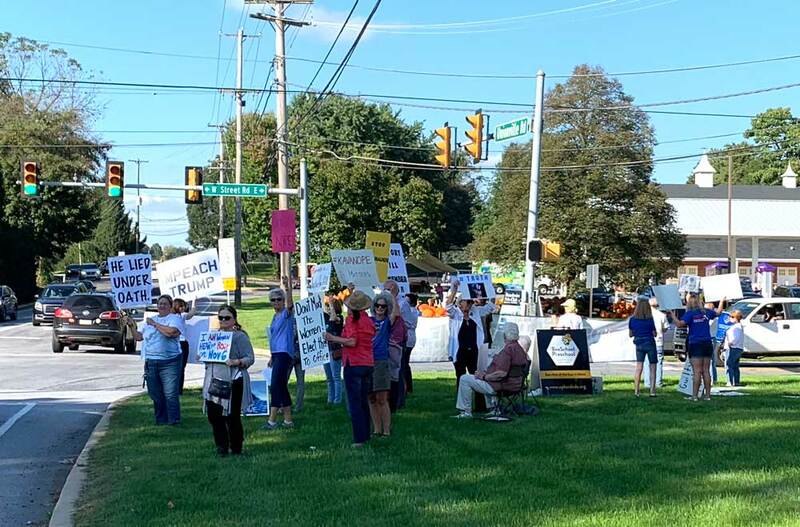 EAST MARLBOROUGH — More than 50 local residents came out to protest the apparent likely confirmation of Federal Court Judge Brett Kavanaugh to the U.S. Supreme Court at the intersection of Routes 926 and 82 in Willowdale, Wednesday afternoon. A planned counter-demonstration by supporters of President Donald Trump and Kavanaugh appeared to draw far less support, with no more than six counter-protestors — and for most of the first hour, just one. The event, coordinated by the Kennett Area Democrats, was not specifically intended to change hearts and minds, but rather serve as a reminder of the upcoming election and the issues confronting America in this era of Trump, KAD Chair Wayne Braffman said. Based on the reactions of the busy nearly rush-hour traffic, car horns beeping in support seemed to strongly outnumber those making often obscene verbal objections to the protestors — notwithstanding the vile, often personal invective that spewed from the handful of angry drivers seemingly incensed by the protestors. Braffman noted that Democrats, independents and even frustrated but alienated Republicans have been emailing, calling and coming into the campaign headquarters at large and unprecedented numbers offering to volunteer and contribute to the fall campaign. 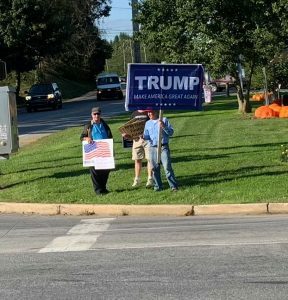 A handful of Pro-Trump/Kavanaugh protestors turned out to counter those in opposition. And while he said that enthusiasm has been high, the entire process surrounding Kavanaugh and allegations of sexual misconduct and/or assault have sparked it even higher locally. Of course, just across the street, different sentiments were expressed. Steve Lee Parsons of Downingtown said he drove an hour to attend a counter demonstration to show his support for President Trump and Judge Kavanaugh — and found himself alone initially, as the counter event was only put together a couple of hours earlier, via Internet. More counter-protestors would arrive as the hour wore on, but the handful were dwarfed by the more than 50 anti-Trump/Kavanaugh protesters across the street. “I’m a big Kavanaugh and Trump supporter,” he said. He said he tries to oppose everything supported by the Democratic Party, and noted his nickname for them. The protestors from both groups were limited to the northern side of Route 82, as the southeast side of the road was blocked by posts and police tape, at least some of which appeared to be within the road right-of-way. The owners of that property have previously objected to Democratic demonstrations on the property, in particular when it housed the district office of former U.S. Rep. Joe Pitts (R-16). So the “Ladies of Unionville” want their sons prosecuted with sexual assault with NO proof? If it’s determined that Ford lied, she should be arrested & sent to prison for a very long time! © 2019 The Unionville Times. All rights reserved.